To what? Maharajamd's junk shaving method thread? LOL, I was thinking more along the lines of 'DE Safety Razors'. Pictures of deez are too big to upload here anyways. Don't worry. Starbuck... PLEASE jump the ship! I think that is the one I am using, except it's gold colored. Found it when going through some of my Grandfathers stuff my Grandmother left me when she passed. actually, this is the one I am using. 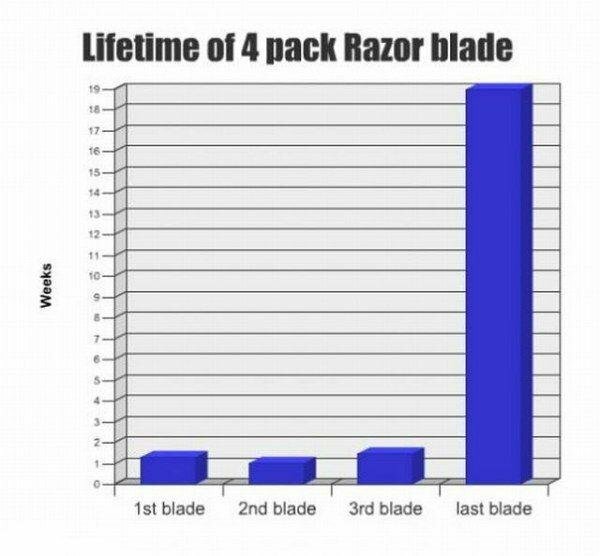 I am actually experiencing the same thing as I wait for my DE razor to arrive. I've been using my last cartridge for like 2 weeks now. Well my mini update. So I've switched to Futur, Proraso green shaving cream and pre-shave (which I use as post shave only), silvertip WSP badger brush and I got a sampler of blades. So far, I'm using it on setting 2, no problems what so ever and it's pretty easy. It does take a little longer but end result is good firm healthy skin. I've started with Merkur blades, and I don't like them. They are not that sharp, more on a safe side. My neck hurts as they pull on whiskers. Now I'm looking for a good stand for brush/Futur, they are over-sized so it's a pain to find something suited. Me either. Many fewer vintage supplies required, just a liberal dose of some good old-fashioned apathy. Probably doesn't brush his teeth either. dry shave like man. pull the hairs out with the dull blade. Proraso is good stuff though. im Irish btw.. this was 3 weeks into no-shave november. and i had to keep it "shaply" for work. ^^ That's not a beard; it's a jock strap for your face. call it what you will, its made of hair. I bought two tubes and a lotion. The cream will last forever, a tiny pea size amount easily creates 3-4 passes. Nice to see this thread is still alive. I've been using my safety razor for about a week now and I LOVE IT! I'm still getting used to it and have had a couple mishaps, but for the most part I'm getting a very close shave and have no razor burn afterwards. I'm rocking a beard right now so I'm just shaving my neck but it's amazing how easy it is to get the line right...much different than my previous 5 blade razor (even with the single blade on the side for trimming). I'm still using the standard gel shaving cream but I'll be upgrading to something better once that's empty. Thanks again Maharajamd for the recommendation on the razor and blades. I'm very happy with both! Starbuck. Jump the ship. I don't have the rendezvous coordinates. It doesn't matter. Just jump the ship. There must be some kind of way out of here! There's too much confusion. I can't get no relief. I'm glad you like it. Once you get a real soap/cream it will take it to a whole new level.